Product and Food Photography - $250 + $50/image: Aperture is one of the few photographers in Albuquerque in the field of food photography, food styling, macro, and technical product shots. 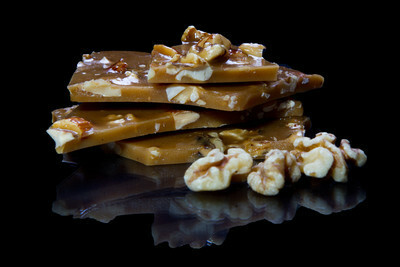 Product shots can be done on white seamless or a shadowless lightbox, while food will be shot on appropriate backgrounds. We will perform macro shots as needed. The setup fee applies to multiple images, provided they all use the same lighting. Package price includes lighting setup, product preparation, unwatermarked web-sized images in a linkable gallery, and full usage rights for the web-sized images to market your product on-line. The package includes limited menu and catalog print rights. Extended/Large print rights are available as an option, and include the full resolution digital negatives. This is required for magazine prints, large web images, large catalogs, and full-page magazine advertisements. This cost is based on distribution. • Digital images with advertisement print rights for one year, up to 3 foot prints (e.g. large flyers, magazines, in-store posters) for additional $50 per image. Print rights for advertisements larger than 3' (e.g. billboard or bus) available at $200 per image per 3 months for anything displayed in New Mexico. National and International use may require additional licensing fees. • Focus Stacking (multiple macro shots of tiny products, combined together to ensure focus) available at $50 per complete image. This combines up to 10 shots into one. • Work-for-hire (you get the copyright) $1000 day rate (8 hours) for photography, includes full-resolution digital images. Editing or food styling is not included. A virtual tour on your Google Places page is an excellent way to promote restaurants, B&Bs, gyms, nightclubs, fashion/merchandise/autos, tourist and seasonal attractions, salons, wedding and event venues, etc. Any business where you're proud of your offerings and the space you've created can benefit from a virtual tour linked directly to your Google search. Show off the merchandise, energy, and ambiance of your establishment to the world! Google Business View is a new program which allows local businesses to add virtual tours to their Places page, created by local photographers and hosted by Google. 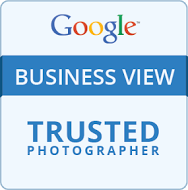 Aperture is the Premier Google Trusted Photographer for New Mexico, launching it in March, 2012 at the request of Google. We'll also do product and business photographs as part of the virtual tour package! This photography requires specialized equipment, training, and certification by Google. Start by creating your business's Google Places page (free), then call us to add a virtual tour. It's personalized, targetted marketing that invites the potential customer into your store, never expires, and increases your business's visibility to the world. Real Estate: Besides standard shots, we may also use HDR shots, long exposures, and medium format film for real estate, depending on the needs. High-Dynamic Range (HDR) shots will show unbelievable detail in the lights and darks, from skies to woodwork, without "neon" colors traditionally associated with HDR. We will take professional exterior and interior shots, starting at only $100 for a wide-angle curbside appeal shot. Forget those ugly point-and-shoot pictures with the yellow cast, overexposed windows, and cramped, dark rooms -- your colors will look great, the lighting will look great, and the house will look better than ever with more detail and roomy feeling than with normal snapshots. For high-end homes, we can also use 6x7 or 6x4.5 large format film as requested. You will be provided with a linkable online gallery for up to one year while your home is listed. • All images are given unlimited license for advertising the house until it's sold or taken off the market.